Valencia CF: Stankevicious future to be resolved in the next few weeks. Stankevicious future to be resolved in the next few weeks. Well Sampdoria now seem to want Stankevicious back to their squad and have made their stance public, saying they want to extend his contract and hoping that Valencia won't exercise the option to purchase the Lithuanian for 1.5 million euros. Stankevicious seems to have become the standard player alongside Ricardo Costa in defense for the past few weeks and is playing reasonably well. I have him rated at 5.5 so far in the season, although there are 2 marks seriously lowering his rank, which he got after making huge mistakes in 2 matches obviously. Otherwise he has been stable enough. 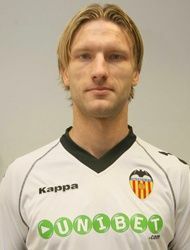 Since Sampdoria want Stankevicious back his agent will come to Valencia in a few weeks to ask about Valencia's intentions with the players and if they are going to purchase him or not. Valencia currently has Navarro, R. Costa, Dealbert and Stankevicious as center backs, but here is also Maduro who can also play at that position and in the summer Adil Rami is going to transfer to Valencia. The question now is you keep Stankevicious and if yes that means at least one central defender must leave, in which case the likeliest would be Dealbert. The Valencia staff certainly has some tough decisions to make and I can only hope Llorente makes the best decision for the club as he has been doing so far.